Exposure by a Salt Lake City, Utah, television station of aftermarket parts being demanded to repair a 2014 Chevrolet Impala front end apparently led to Farmers compensating the shop which went out-of-pocket to install OEM. Valet Auto Body owner Trace Coccimiglio described the insurer practice to “Get Gephardt” host Matt Gephardt of KUTV, according to the broadcast and an article posted Friday. The KUTV broadcast features Coccimiglio pointing out physical differences between the imitation version and the Chevrolet OEM part. KUTV drives home his point that auto safety “comes down to milliseconds and microns” by including footage from Honda’s collision repair website showing how an imitation part could affect the timing of an airbag. Asked for a comment on the story, Farmers said “What occurred is not consistent with our expectations or practices” and it had “reminded all employees on proper estimating procedures,” according to KUTV. Insurance Information Institute media relations Vice President Mike Barry that insurers have an interest in keeping policyholders intact and will be flexible on mandating aftermarket parts when it comes to safety, according to KUTV. But sometimes carriers won’t be, and shops should speak up in those instances if they see an issue, Barry said, according to KUTV. 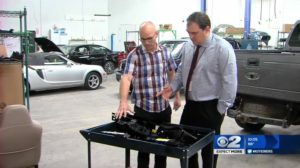 “If an auto body repair specialist believes that an unsafe vehicle is being put on the roads, they have every reason to raise their hand and tell the auto insurer and the policyholder that they’re unwilling to do this,” Barry says on the KUTV video. If you think about it, this logic is a little shaky: We’re going to go ahead and do what we want to do, and it’s on you to stop us if it’s inappropriate. It begs the question of why the reverse shouldn’t be the SOP instead: The repair defaults to OEM parts unless the carrier can prove true equivalency (or aftermarket is the customer’s preference). But in any case, shops should take Barry’s words to heart. The insurance industry is counting on repairers to tell them when an aftermarket part is unsafe, not to keep silent with objections. Unfortunately, deviating from the estimate and using too many OEM parts can be punishable offenses for insurance direct repair program shops — which disincentives shops from being the check and balance Barry suggests. The video also mentions auto body shops’ lawsuits in multiple states (Utah is one of them, though Valet Auto Body is not a plaintiff) against auto insurers and interviews new plaintiffs’ attorney Mark Shurtleff, the former attorney general of Utah. If you’re one of the collision repairer plaintiffs in New Jersey, Mississippi, Utah, Louisiana, Missouri, Kentucky or Virginia, you might want to check out the video and see your new counsel. Shurtleff was brought earlier this year to replace former point attorney Allison Fry of Mississippi-based Eaves Law Firm. In April, he represented the dozens of collision repairer plaintiffs in oral arguments before the Eleventh Circuit Court of Appeals. The court has not yet reached a decision.